How is it Friday already????? Wow, I can't even believe it's my last day in Growing In Unity. It's been a fun week, but I'm not going to get all sentimental on you..... sniff sniff..... so, let's get to business. You know how much I love Phyllis Harris stamps???.... Nod your head.... yeah... you know I love them.... Well, why would I not choose to use one for my last showcase project? That would be pure craziness! This set is called "Your Wings Exist," and it's on sale for under $10!!!!!!!! You better hurry and grab one before they are all gone! So, I may have gone a little flower crazy, but is that even really a bad thing? Ha ha ha ha I love making shaker cards these days, although I will admit there is quite a learning curve and it takes a while to work out in your head just how you're going to make it all work they way you want to. With that being said, I totally love this card and I hope that the wonderful woman I send it to will love it as well! It's been a fun week and thank you all for commenting and stopping by. I really appreciate it all. Please feel free to follow my blog, I'd love to have you all here! 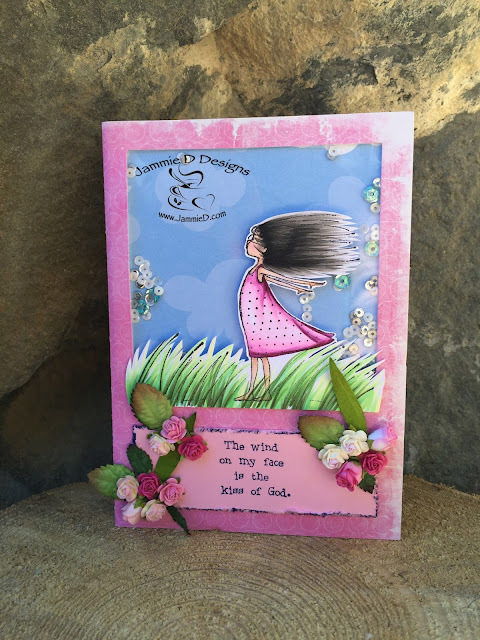 Beautiful card created to finish out week. I am enjoying making shaker cards. Fun fun. Thanks for sharing your creativity with all of us. Gorgeous, lovely, stunning! This is a beautiful card! This is absolutely beautiful (and NOT overboard on the flowers). Your friend will love it. I love this sentiment! Thank you for a beautiful week of inspiration. Beautiful shaker card with pretty embellishments! Love your pretty coloring on this sweet image too! Thanks for the fun GIU week... I have enjoyed each of your cards! Your card is beautiful Jammie! Love the coloring! Love the colors and the flower embellishments. Oh, this is just so pretty!! Love that you made it a shaker. (Okay, I am a little bit flower and sequin crazy, myself!!) Love Phyllis' images and this one is just so sweet. Love the colors you chose and your design is wonderful. Thank you so much for sharing your art with us this week!!! This is so pretty! I love the pink and your coloring is amazing!